Posted by tomflesher in Micro. 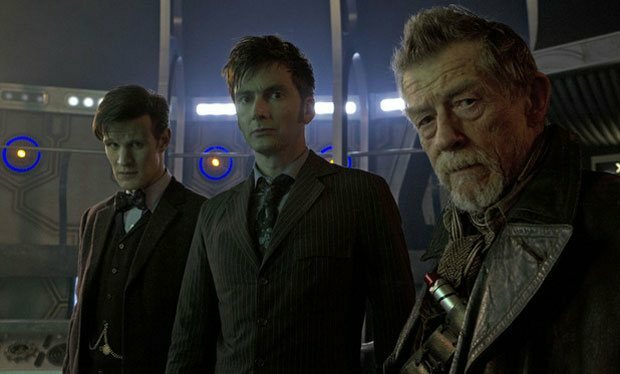 The previous post introduced a problem that arose in the Doctor Who 50th Anniversary special in which uncertainty was a core element. To explore that problem in depth, we’ll need some tools to work with uncertainty. Also, that problem was a little grim, so let’s take the edge off. Let’s say that a friend of mine, Matt, is visiting and I need to order food. Matt’s favorite food is fish custard, so it makes sense that I should order him a dish of fish custard. Simple enough. Of course, if my other friend Peter were coming over, and I knew Peter didn’t like fish custard and much preferred haggis, it wouldn’t make sense for me to order him fish custard. Obviously I’d order haggis for him. To make this work mathematically, let’s say that each friend of mine likes his preferred dish about the same, so we could say that Matt gets utility of uM(fish custard) = 1 from eating fish custard and uM(haggis) = 0 from eating haggis, and Peter gets the reverse – uP(fish custard) = 0 and uP(haggis) = 1. If I want to maximize my friend’s utility, then I should do so by buying each friend his favorite dish. But what if I don’t know who’s coming over? Since uM(fish custard) = 1, then the expected utility of my guest from fish custard is just πM. For haggis, of course, the same logic applies – Matt gets 0 utility, so we can ignore him, and the expected utility ends up being πP. So, whichever friend of mine is more likely to show up should get his favorite dish ordered, and if I don’t know who’s coming, I might as well just draw names from a hat. That means we don’t get to the indifference point until Matt is twice as likely to arrive as Peter! Funny how these probabilities influence the choices we’ll make. Sometimes things get a bit more complicated, but that’s a post for another time. Posted by tomflesher in Uncategorized. Major, major spoilers here. If you haven’t yet seen the Doctor Who 50th Anniversary Special, please avoid this post. During the 50th Anniversary Special episode of Doctor Who, there was an interesting scene where a group of characters and their malevolent clones were negotiating a treaty that would determine, in part, whether the Zygons (an empire of malevolent aliens) would take over the Earth. This presents some quite interesting problems that were solved by some quite interesting guys – the Tenth and Eleventh incarnations of the Doctor. Obviously each side had opposite incentives. The Zygons needed a planet to live on, and the human population did as well. Take for granted that the populations can’t coexist and you can see that this is what’s known in economics as a zero-sum game. Since they would not agree to share the planet, one side would have to come out the winner in the negotiations, with the other losing. Similarly, since each Zygon cloned a human negotiator, it inherited at least some of its human’s memories, meaning that we can assume symmetric information. In cases like this, it’s usually up to the agent with the higher valuation of the asset being negotiated to make some sort of concession to the agent with the lower valuation in exchange for agreeing to give up any claims – in other words, pay them to go away. In other cases, the agents will agree to let an arbitrator make the decision for them, under the assumption that the arbitrator won’t be clouded by personal decisions and will make the “best” choice, for some value of “best” to be determined. The Doctors (played by David Tennant and Matt Smith) opted for an entirely different (and clever) solution, albeit one that wouldn’t work in the real world: they wiped the humans’ and Zygons’ memories so that each would forget which side they were on, allowing for efficient resolution of the problem. The theory, which is similar to Richard Rorty’s Veil of Ignorance, is that people who don’t know whether their side stands to benefit will reach an equitable solution, if not one that they might have argued for in the first place. As such, it’s an example of hidden information. The same thinking generates the idea in law and economics of efficient breach. This might result in the solution that’s efficient in the economic sense, but it probably won’t lead to anyone being the best off they could be.